(Bloomberg) -- Stocks kicked off the second quarter with a roaring start, but UBS Group AG says the market may need help to keep going. 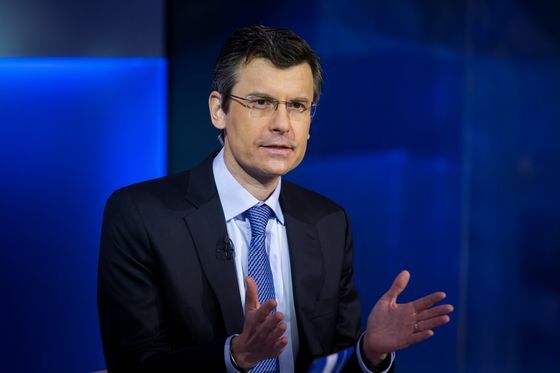 “For meaningful further upside from here, we would need to see indications that the growth stabilization is translating into an upswing, profit growth is continuing, and a flat yield curve is not translating into weaker bank lending,” UBS Wealth Management’s Global Chief Investment Officer Mark Haefele wrote in a note April 8. The torrid year-to-date rally in stocks has continued in the second quarter, even after a setback Tuesday. The MSCI All-Country World Index is up 1.8 percent this month, while the S&P 500 Index has advanced 1.6 percent. To Haefele, that signifies that investors are already expecting “a relatively benign scenario” and further increases may not be as easy to come by. Equities have rallied strongly since bottoming on Dec. 24, as concerns about U.S.-China trade tensions eased, the Federal Reserve turned more dovish and China took policy steps to combat economic weakness. Volatility across assets is near historic lows. 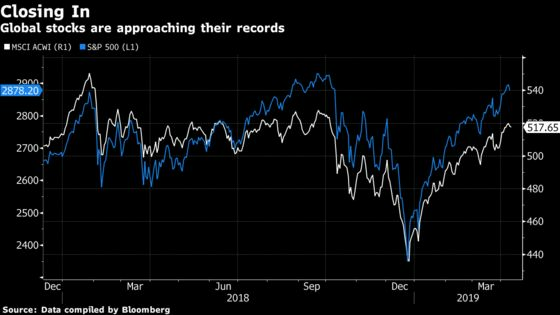 Amid that environment, the MSCI ACWI is about 6 percent off its January 2018 record, and the S&P 500 is about 2 percent below its September peak. Goldman Sachs Group Inc. agreed with the idea that economic performance is coming back to center stage. Sundial Capital Research found some amount of caution to be justified. The firm crunched numbers related to stock gains and profit growth for U.S. companies, analyzing more than 15 instances when the S&P 500 started first-quarter earnings season at or near a 100-day high to address concerns about whether shares could rally from here. Goepfert’s analysis found that the S&P 500 on average was down 0.3 percent after starting first-quarter earnings season at or near that 100-day high, though after six months that figure turned to a gain of 4.3 percent. One year later, on average, the benchmark was up more than 11 percent.